Mounted on your sprayer, Tridekon CROPSAVERS® can reduce crop trampling by 90 percent when applying chemicals or fertilizer to your crop. Field proven for over 15 years – CROPSAVERS are built heavy to last and at $6 per acre in savings you can't afford not to use. Tridekon CROPSAVERS divide the crop around the sprayer wheels. The corrosion-proof stainless steel cone houses a heavy-duty parallel lift system that can be adjusted to the optimal height for your crop type. Suspended using a spring CROPSAVERS move up vertically out of the way if they encounter an obstacle. 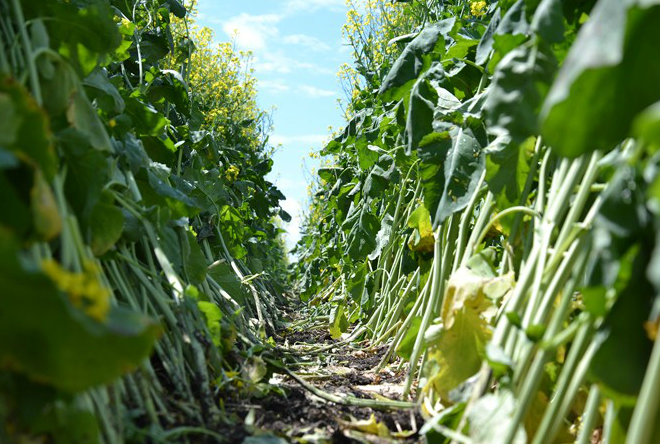 CROPSAVERS can be used for both fungicide and pre-harvest desiccating in a variety of crops including canola, beans, cereals, cotton, and corn. 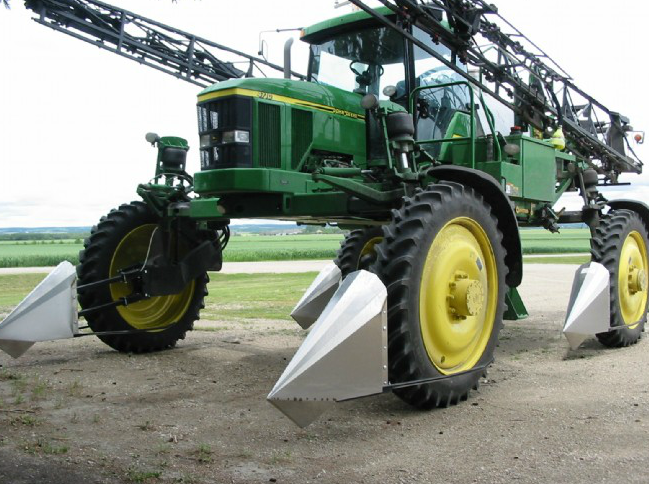 A 90-foot sprayer with a 12.4-inch tire can trample three percent of your crop. That measures to 20 acres of crop lost for every section of land sprayed. CROPSAVERS reduce these losses by up to 90 percent. A crop valued at $200 per acre, CROPSAVERS will increase your bottom line by approximately $6 per acre. The cones are built with non-corrosive, strong stainless steel that will prevent chemical absorption and mud build up. Its ultra-smooth design prevents crops from hanging up on the cone. The fully enclosed cone (back and bottom) eliminates mud build up inside the cone, resulting in less maintenance and improved long-term reliability. Crop Dividers simply bolt-on your machine with a bolt-on. Designed bolt-on for virtually all high-clearance sprayers. Weld on kits are available for pull-type sprayers and tractors. Our Quick-Attach bracket bolts onto the bolt-on bracket. These pieces remain on your machine. The bolt-on with the Quick-Attach feature allows the operator to remove or install the crop divider in minutes. Every Quick-Attach bracket will bolt-on to any bolt-on bracket with the same bolt pattern. When you trade your sprayer in, most often you will only need a new set of bolt-on brackets. The deflector arms guide the crop past the tires. Our floating parallel lift keeps the divider horizontal while moving up and down. The unique tip design has many benefits. The bottom of the cone has a design like the bottom of a boat. This results in better flotation in tough or wet conditions, thus protecting the divider. The slim dividing tip gently opens the crop canopy in both short and tall crops. The height of the CROPSAVER shields can be adjusted with a bolt. This enables the operator to easily change the height of the cone for different field conditions or crop heights. Recommended height is for the bottom tip of the CROPSAVER to be 1/3 up the height of the plant. Operator can set CROPSAVERS to any crop or field conditions. Built with self-lubricating bushings, which eliminates daily greasing. Lockup features allow you to manually lock up the CROPSAVERS to load on and off trailers. This feature can be replaced with the air kit option. For users who change tires on their sprayers, Tridekon makes the CSP Jack, which pins into the outer Quick-Attach bracket on the sprayer, facilitating faster and safer changes. Deflector extension shield: Developed in cotton fields, this can be used in a variety of crops to keep the crop away from the drive motor and wheel. It can be attached quickly and easily to an existing set of CROPSAVERS or ordered as an option with a new set.